Greetings everyone. I apologize for the lack of reviews, but unfortunately business trips tends to burn up a lot of time. You have to get all your regular work done, plus prep for the trip, plus all the extra work during the trip. Throw in the fact that I'm trying to minimize my time away from home, and well, you wind up with a lot of work and not alot of blogging. Now, that's not to say that I didn't try to plan ahead for my trip to the Chicago suburbs. In fact, Indy Eater of http://wouldibuyitagain.com/ was nice enough to give me a few tips before I left. My "big" plan was to hit up Culver's on one day, and Steak 'n Shake on the other to see if Indy Eater was right that Culver's shakes are much better. Well.... that didn't happen. The first day we checked out a place called "Frankly Yours" where I tried a double dog. How could I resist such a fun sounding treat? It uses Vienna Beef hot dogs which seems to be the staple of every hot dog joint we saw. It wound up being two thin hot dogs in one bun with some fresh condiments on top. It was tasty, but not exactly special. The next day I had Subway. I "ate fresh", but I was unamused. Me being me, this was not the end of the road. I was not ready to except defeat so I wandered the area near my hotel (on foot since my boss had the car). Great, I found a convenience store! Oh what wonderful treats will I find! Hmmm, the nestle cabinet is empty, but there must be more... there it is, a small freezer full of..... NOOOO! Ben & Jerry's??? And Breyers? Seriously?? I didn't fly 850 miles for Ben & Jerry's. I made another lap around the store but there was nothing local here. How disappointing. You know what that means, there is but one chance for me to score some ice cream: the airport! That's right, there is but one giant international airport between me and ice cream glory. They must have local stuff right? There was almost a four hour difference between my flight and my boss's flight. Since he's got the car, that means I have a lot of time to waste. Now, originally I had planned to read a book during this time, but with my epic failing so far, I needed to find something to make up for all this traveling. As a bonus to wandering terminals 1, 2 and 3, it would give me the chance to find some presents to bring home to the family (pretty sure that's an unwritten business trip rule). I started my journey in concourse B, terminal 1, which is home to a big ol' dinosaur. See my flight was leaving from concourse C (terminal 1), so I decided to head on over to terminal 2. Well, what do we have hear in the section joining terminals 1 and 2? It's a Johnny Rockets! Ok, technically I haven't had one of their shakes yet, but I was hoping for something a little more local. Let's keep looking. 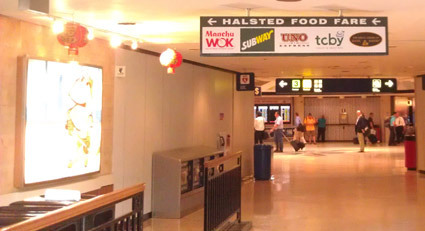 As I enter the older Terminal 2, I am greeted by the Halsted Food Fare. A TCBY? They may be "the country's best yogurt", but they have long since reduced their forces in New England. I really want ice cream, so I continue onward and start wandering down concourses one at a time. B-Smooth? 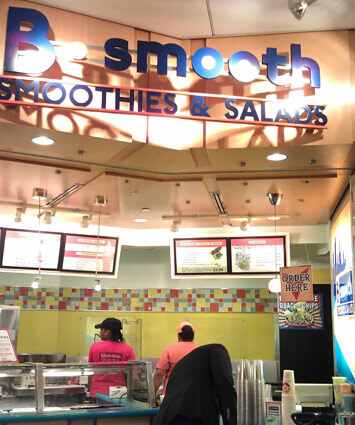 It's tied into Burrito Beach and seems to specialize in non-dairy things... I'm outta here! Oh man, this is just depressing. Where is all the ice cream? How many millions of people fly in and out of this place and there's not one decent ice cream stand? Really? People spend billions on ice cream and I can't find any. Trust me, I've been looking. I've even been looking at the little food stands everywhere and the best they do is yogurt or a yogurt parfait. I mean, of all the food stands, only a few even carried chocolate milk. I am so disappointed... I am also immensely tired from my journey through terminals 2 and 3. It's getting late. Time to pick up some presents, a shake, and head home. My little buddy gets himself a United 747 toy. My daughter gets a neat looking Chicago PEACE t-shirt, and for my wife? I dig up some Fannie Mae chocolates. I saw a half dozen brands of chocolate but this was the only one that was local! 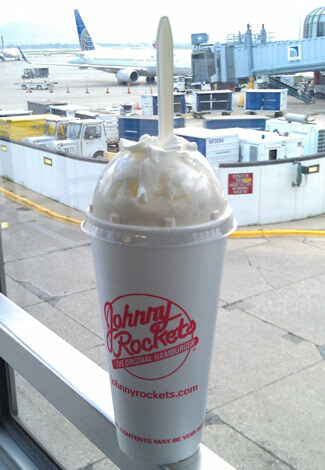 After stealing a stack of napkins from one of the many Starbucks littered throughout the airport, I proceeded to wander good ol' concourse B (terminal 1) as I enjoyed my shake through a straw that was way too thin. It was a pretty good shake, but it tasted more like vanilla with Oreo cookies rather than a true cookies n' cream flavor. I would also get a cookie bit jammed in my tiny straw now and then. When I was finished, I had a pile of Oreo chunks at the bottom of my cup. Hmmm, I guess that's why they had given me that spoon that I chucked in the trash. Ok, I'm full, good thing I didn't get a burger with it. Time to meander over to my gate. I pass Eli's Cheesecake-to-Go. Oh how my wife would be more than happy to check out some local Chicago cheesecake. I notice a fridge/freezer in the back which makes me spy something interesting on the menu: Eli's cheesecake cookie sandwich. Oh wow, now doesn't that sound unique? This is the Rocky Mountain Chocolate Factory and it was by far the most wonderful and fun display I saw in the whole airport. 20+ different kinds of candy coated apples. I'm sorry I didn't get a few close up shots. 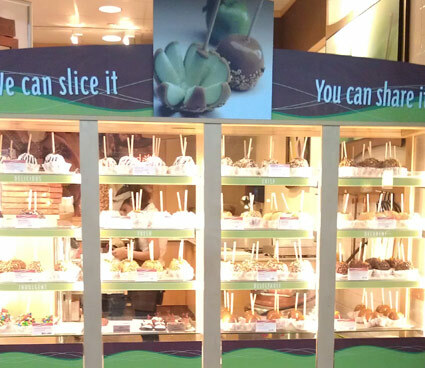 Different coatings, different toppings, frostings, oh so cheerful. I took a quick peek inside to see their other chocolates and again I was sad that I was full. Time to head to concourse C and call it a night. Well what do we have hear? Oh my, after three hours of walking, I discover ice cream just a few hundred yards from my gate. 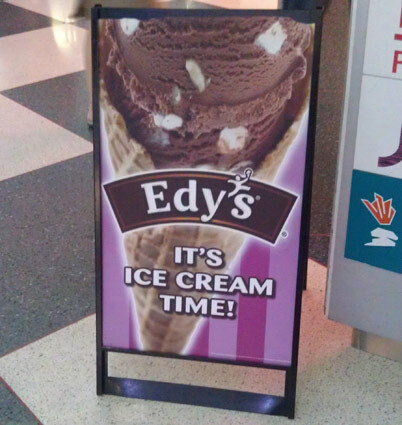 Of all the wonderful Midwest ice cream companies out there, California based Edy's is the only one with a stand in Terminals 1, 2, and 3? I just don't get it. Blue Bunny is in neighboring Iowa, why don't they kick these punks out? Cedar Crest is in neighboring Wisconsin, get yourselves down here! I know I'm not exactly familiar with Midwest brands (since I have no access to them), but I know they are out there. Come on, get in here and protect your local turf! As a disclaimer, I did a bit of research and discovered there is a Haagen-Dazs stand in terminal 5. That makes sense since Nestle owns both H-D and Edy's. I would have checked it out but you have to leave the secure area to get over to terminal 5, meaning I'd have to get through security two more times. That's way too much effort considering how tired I was. I find a seat and patiently wait for my plane to arrive. After a last minute snack, I board my plane and so ends my four hour adventure at O'Hare airport. If this trip has taught me anything, it's that I get a kick out of checking out regional food now. I just wish I had gotten out a bit. Sure, we had dinner at a so-so sports grill Wednesday night where I learned that if something burns your tongue long enough, at some point it will make you want to, well, you know. And sure, we checked out a local boring buffet on Thursday, but I was really hoping for some regional frozen treats on my trip. Oh well, live and learn I guess. This won't be my last trip, so feel free to send in your tips before I head back again. It looks like they seriously need to source some better ice cream. Heck, last time I dropped into Austin, they had Amy's Ice Cream at the airport... and Salt Lick BBQ! Glad you found Eli's Cheesecake. That and Garrett's popcorn are the local Chicago sweets represented in O'Hare. As for ice cream, truth be told there aren't many homemade ice cream scoop shops in the Chicago area--Bobtail, Homer's--though there are some nice local pints to be found at farmers markets. But most shops seem to import ice cream from Wisconsin, the best of which is Chocolate Shoppe Ice Cream made in Madison, WI. They make some incredible flavors: Coconut Almond Bliss, Horchata and, in the autumn, Snap-o-lantern. @Julien: see, that's how you do it! @Brad: at least Wisconsin is regional, and Chocolate Shoppe would be a great choice. Here's hoping they take things up a notch!